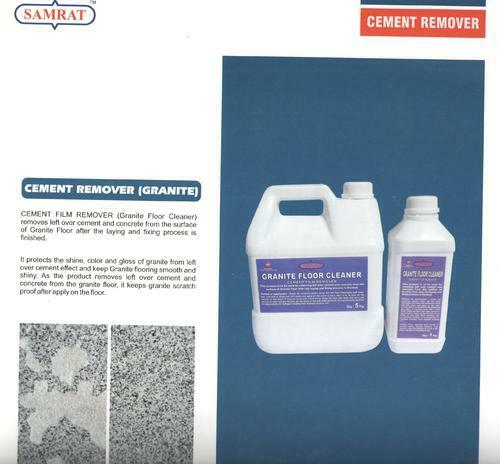 Owing to the efforts of our skilled professionals, we have been constantly engaged in offering a qualitative assortment of Cement Remover. Bhagwati Traders, one of the most assuring manufacturer, trader and supplier enterprises, introduced the advanced Water Pumps and Fevicols in 1990. We have remained at the vanguard of producing best in class Single Phase Self Priming Monoblock Pumpset-Aluminium Body, Single Phase Self Priming Monoblock Pumpset-Shallow Well, and Single Phase Self Priming Monoblock Pumpset-Magic Suction. Since the commencement, we are steadily pushing ourselves to render the tremendous levels of content to our valuable patrons by providing them a series of quality approved pumps that cater a series of advantages such as light weight, precise operation, sturdiness, rust-proof finishing, high pumping efficiency and ease of maintenance. Besides, we are managed by a single equation to achieve timely objectives for production and delivery of our offered products range, which assisted us in expanding our presence across the nation. We are aided by a hard-working team that endeavors to adapt closely to our customers demands and makes assured to consolidate their acumens in our range of products. It makes us liable to develop user-friendly water pumps which are furnished with features that are profoundly demanded by our estimable clients. We believe in uniformly improving our product designs to bring out a developed model that includes modern technological improvements. We take dignity in getting recognized for business ethics and highly productive products that supported us to develop a long-term tenure with our esteemed clients. Bhagwati Traders are looking inquiries Delhi, East Delhi, South Delhi, Delhi NCR, Gurgaon, Lucknow, Kanpur, Varanasi, Jaipur, Jodhpur, Ajmer, Bikaner, Kota, Udaipur, Bhilwara, Alwar, Agra, Meerut, Aligarh, Allahabad, Banaras, Mathura, Jhansi, Ghaziabad, Noida, Bareilly, Moradabad, Saharanpur, Uttar Pradesh, Punjab, Chandigarh, Jalandhar, Amritsar, Ludhiana, Bathinda, Pathankot, Patiala, Hoshiarpur, Himachal Pradesh, HP, UP, MP, Shimla, Dharamshala, Uttrakhand, Dehradun, Haridwar, Roorkee, Rudrapur, Rishikesh, Nainital, Udham Singh Nagar, Gwalior and all over India.